James Strong wants a shortcut on his desktop that will shutdown his computer. I tell him how to make one. Right-click the desktop and select New, then Shortcut. When the resulting wizard asks you for the location of the item, type shutdown -s. Click Next. Rename the shortcut or keep the default "shutdown," and click Finish. When you double-click this shortcut, Windows will count to 30, then shut down. The wait, of course, is so you can abort the shutdown. But don't bother with the Close button on the window that tells you of the upcoming event; all that does is close the window. Once again, right-click the desktop and select New, Shortcut. But this time, when the resulting wizard asks you for the location of the item, type shutdown -a. 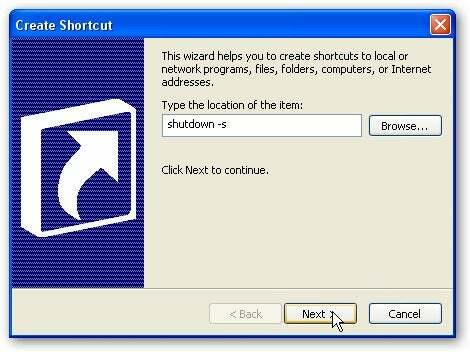 And name this shortcut abort shutdown.